Price reduced, must sell. $9,900 Trailer is a double axel storage but not road worthy. 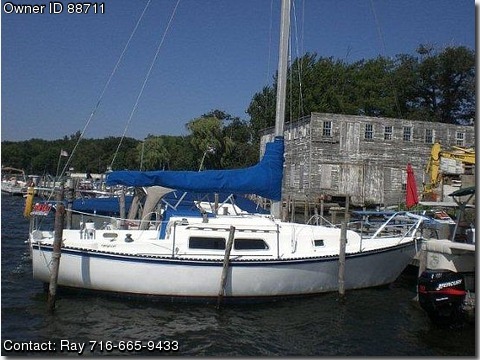 Currently located on Chautauqua is a fresh water 1984, 28ft Newport sailboat by Capital Yachts. All sails are in good condition (does not have roller furling). Draft is 5ft2in, beam is 9ft9inch. The boat has a 14hp Universal Diesel inboard engine and wheeled steering. The interior is in great shape and woodworking stands tall. All rigging is in excellent condition. It also comes with a tandem axle steel storage trailer (not road worthy). Basically the boat needs nothing and is ready to sail. More pictures are not available at this time because, boat is tarped for winter storage. I will gladly take the tarp off for very interested buyer, if you come to see it.